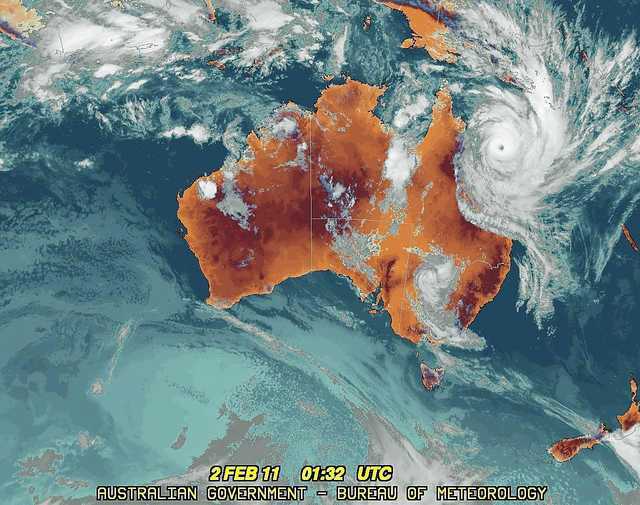 As I type this, Queensland, Australia is getting whacked by Severe Tropical Cyclone Yasi, a category 4 or maybe 5 typhoon. This is a very strong storm, the news says it is stronger than anything in the memory or “recent generations” and may destroy even “Cyclone proof” homes with sustained winds of 300 kilometers per hour. That’s about 186 miles per hour. Winds may gust up to 40% higher than the sustained peak. That’s gusts of 420 Kilometers per hour, or about 260 miles per hour. Plus, being a continent, and not a small island, there are tsunamis probable. With an island, the water can go around the land, on a continent, the water has no where to go but ashore. To me this storm looks like it’s going to be really really bad. This picture forecasts the storm coming ashore as a category 5. I hope Australia makes it through with amazingly little damage and minimal deaths. I’ll be thinking about them. I have been through several hurricanes, here in Cayman and in Hawaii. Mainly Ivan and Ewa. There is nothing that can compare to the power of a hurricane. Click HERE for the Australian Government Bureau of Meteorology.